Rock climbing in New Mexico is a sampler platter. There’s a little bit of everything across the whole state: varied sport climbing, where climbers clip protection into pre-placed bolts; adventure climbing, where climbers place their protection in cracks and remove it later; and bouldering, where you can do harder but shorter climbs with no ropes. All are exhilarating. You’re using your muscles to defy gravity and scale sheer rock faces in unique New Mexican landscapes, from Ponderosa forests to desert oases. Whether you’re just beginning to climb or have been at it for years, there is some type of climbing in the state to pique your interest. Avid climbers spend lifetimes here and never get to it all. Climbing is an inherently dangerous sport. The safest and most controlled environment to get a handle on the basics is a climbing gym. Albuquerque’s Stone Age Gym is a massive modern climbing gym with excellent facilities. Santa Fe Climbing Center offers fewer options, but makes up for it with a small, friendly staff and welcoming local climbers. Each place provides all the gear and know-how to introduce you to the sport safely. Of course, these places are also great for seasoned vets short on time who are looking to gain some extra-strength climbing muscle. Bouldering is rock climbing on rocks that are no higher than 20 feet and therefore require no rope or technical gear. The most diverse option in the state is Ponderosa, a tucked-away corner of the Jémez Mountains about an hour from Albuquerque and two hours from Santa Fe. The setting is fantastic: Ponderosa forest surrounds a variety of boulders formed in the wake of the ancient supervolcano that formed the nearby Valles Caldera. Its high elevation and cool temperatures make this a great summer climbing area. Ragged teeth of granite jut out of the Río Grande valley east of Las Cruces; these are the Organ Mountains, home to some of the most remote technical climbing in New Mexico. The range runs 20 miles from north to south, parallel to I-25. If you’re looking for long days of high adventure, this is the place: For beautiful, austere alpine landscapes and challenging days with few people around, the Organs are paradise. Similar climbs can be found in the Sandía Mountains, the range overlooking Albuquerque. If New Mexico features a singular destination climbing area—where people come from around the country to get on the rock—the Enchanted Tower, outside Datil, is it. 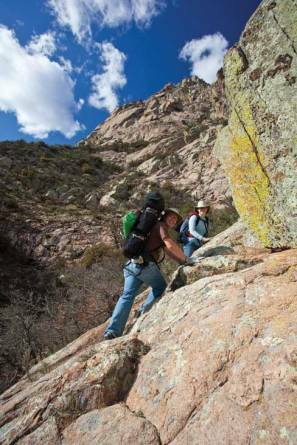 Rarely visited by anyone other than climbers and hunters, the Datil Range is an idyllic setting of New Mexican forest and mountains—and then there’s the climbing: The Tower offers everything from beginner-friendly sport climbing to some of the hardest climbing in the state. The camping is free and the people are approachable. Ranchers who hold a key to a gate entering the area sometimes lock that entrance, so be sure to check trusted climbing resource www.mountainproject.com for access information. If you’re a climber, or want to be one, Santa Fe is one of the best places for you to visit—or, better yet, to live. Although there are few options right near town, there is almost every type of climbing imaginable within a two-hour radius. Diablo Canyon and White Rock offer both traditional and sport climbing options, while the Sandías offer exciting and isolated granite climbing, and El Rito offers some of the best and most physical sport climbing in the state. For more detailed information, refer to local climbing bible Rock Climbing New Mexico, by Dennis R. Jackson. Mountainproject.com provides details on routes, conditions, and resources.